Has anyone evaluated this needleless connector? We use Bbraun tubing with a different positive displacement connector and Bbraun wants us to switch. I didn't speak with the rep. directly but it appears to be a split septum with somewhat clear external housing. I wonder if M. Ryder or C. Chernecky have looked at this product? Once again the words "cheaper" than what we are using are being thrown around. Product testing or invitro testing is scientific research. The rigor of the methodology of any scientific research whether invitro or invivo determines the strength of the study and the results. Even with FDA submissions the rigor of the methodology is different with different companies and products. These are available online. So to understand what research is done it is important to reivew the actual study. Invitro studies are the studies available to medical manufacturers. Once the product is available in the clinical settings clinical data can be collected. daylilly-- I work for B.Braun and know that Caresite is on a limited release right now. B.Braun is a very conservative, safety-first company so their research and due diligence with a new product I know is thorough (sometimes frutratingly so!). I would be very surprised if it's cheaper than what you are using now-- other than some kind of silver-covered product which receives a premium price tag. I believe more studies are coming out this year in 4Q. You can get more information from me or call 800-227-2862 which is BBraun's Customer Service number and they can put you in touch with your local rep.
Our facility uses Bbraun tubing and another needleless connector manufacturer (not silver coated). My Braun rep. is trying to get us to switch to the caresite and the pitch was that it was cheaper than the current needleless connector we are using. Since this is such a new product, I'm hesitant to change. We have made the switch to the CareSite needleless valve and it is completely flat on top - it is not a split septum. BD has the only decent split septum on the market, the Q Syte, but it is very expensive as is their extension tubing that has it on there. Our PICC team made the decision - they love this valve. They trialed 400 of the valves before we decided to make the change. We also have it on a 6 inch power injectable rated extension tubing so CT can use the power injector, and we like them. it is rated to 300 psi with a flow rate of 10 ml/sec. The pricing is very good. It's been almost 3 years since my original post. Are any organizations using this product? 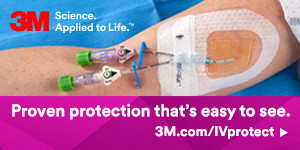 Has anyone had any success with reducing or maintain current infection rates (which can be attributed to this product)?